My first trip out of town was a success, I think. I got quite a bit of work done and even got the chance to sleep through the night for several nights in a row. I know my husband had a rough night or two, and we were both ready for me to come home, but everybody survived. I called home to talk to Jellybean on Tuesday night. He told me all about playing with his friends at preschool, singing songs and mentioned something about dada and a new dishwasher. 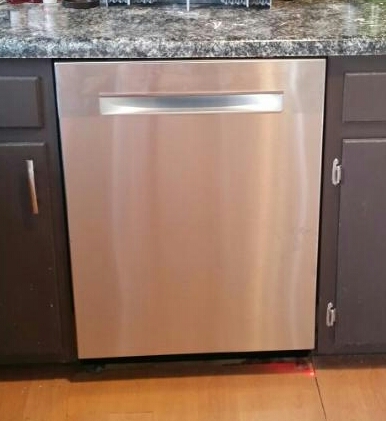 I thought it was odd that he would mention a dishwasher, but I thought he might be talking about a play kitchen. I asked hubby about it later. He got really quiet. Surprise! 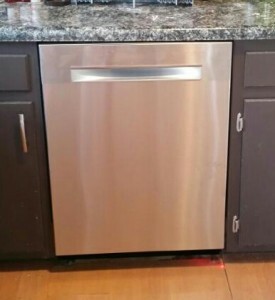 We really do have a new dishwasher! Haha, Jellybean spilled the beans. It was still a surprise, though, because I had no idea hubby would replace our dishwasher while I was our of town. The new one is SO quiet and doesn’t leak, hang up, smell like a smelting plant or squeal like a banshee. I got in Thursday night after the boys had gone to bed. Lollypop woke up at about 415, so I got up with him. I turned on the light to change his diaper and the look on his face when he realized it was me was just awesome. He had a big grin and was SO excited! We were up for quite a while longer than normal as he patted my face, chattered at me and hugged my neck. I didn’t mind it. Jellybean woke up the next morning and said, “Oh hey, you’re back.” as if it was no big deal that I was gone. That’s my laid-back kiddo for you. Later, when I picked them up from daycare, he did tell me that he was glad I was home. I got quite a bit of work done on the stocking, but didn’t finish it during the trip. I got the heel halfway done in the airport before the flight home, missed a stitch somewhere, and just put it away. I could have pulled the heel out, put in waste yarn and continued down the foot, but at that point, I was so exhausted and brain-fried I didn’t even want to think about it. Heels and toes should be done when I have time to concentrate. I found that time Friday night and I’m ready to continue on. 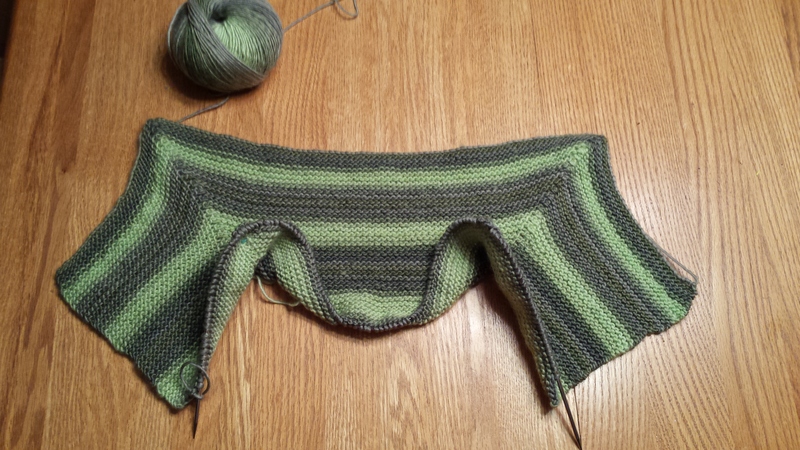 I started to cast on for Jellybean’s 2016 Winter Sweater, but I didn’t bring the whole pattern with me. I made copies of the pertinent pages, or so I thought. I didn’t think to copy the measurement page. I cast on the 100 stitches, and it just felt like it was going to be really small. I didn’t want to waste time on it and I really felt like I would be ripping it out if I kept going. So, I undid the cast on and decided start it again when I can make sure I’m making the right size. Well, it turns out that there is no measurement page. I did the calculations for the gauge and I was definitely on track to make it too small. 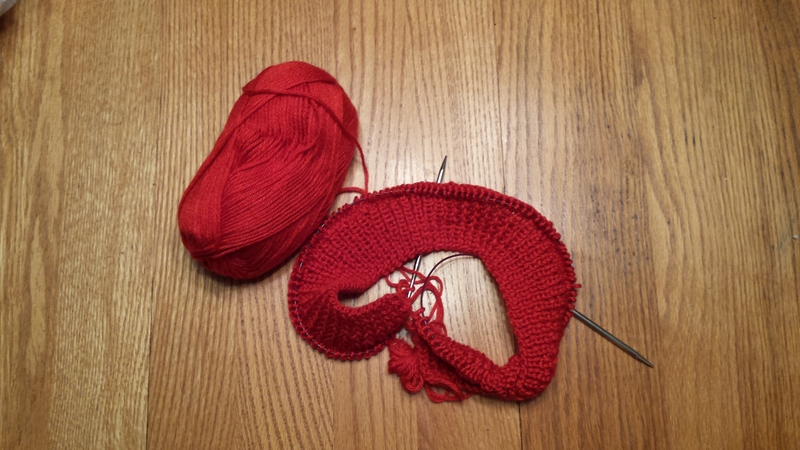 The stitch gauge is 9 stitches over 2 inches, so the size 4 sweater would be almost 25 inches around. 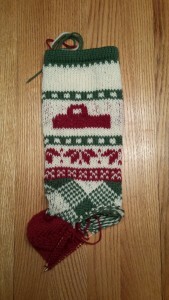 After I got home, I measured last year’s sweater…. it was 28 inches. I’m so glad I didn’t keep going. I’ll be making the size 6 instead. Cast on for JB’s sweater. 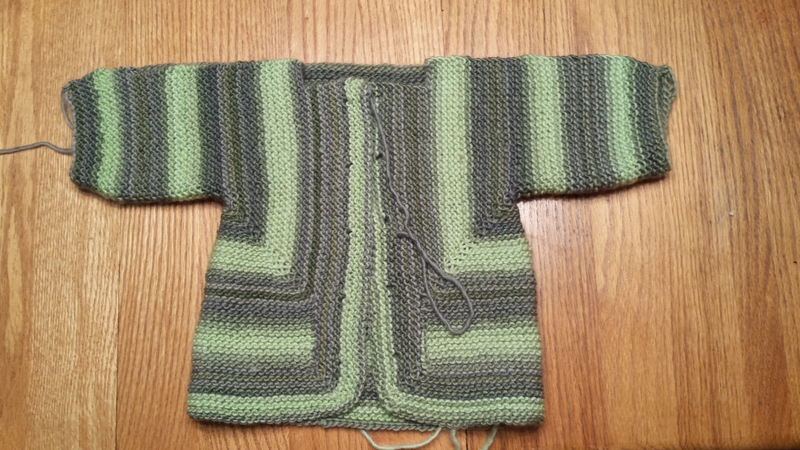 I will also be changing the pattern to be a zip-front sweater rather than a pullover. I’m using the Wonderful Wallaby pattern. I guess the pattern will be more of a guide, though. Changing it to have a zipper rather than being worked in one piece is a significant difference. I will have to make the pouch into two pockets, but I have an idea on how to manage that. Before I left, I did manage to finish knitting on Lollypop’s winter sweater. I need to sew it up and get buttons for it, but it’s still 90 degrees daily, so I have some time. There’s not been much else going on this week. Just the happy homecoming and trying to get back into the groove after the trip. I have quite a bit to do for work, but I hope I’ll get some good knitting time, too. I’ll leave you with this little gem. 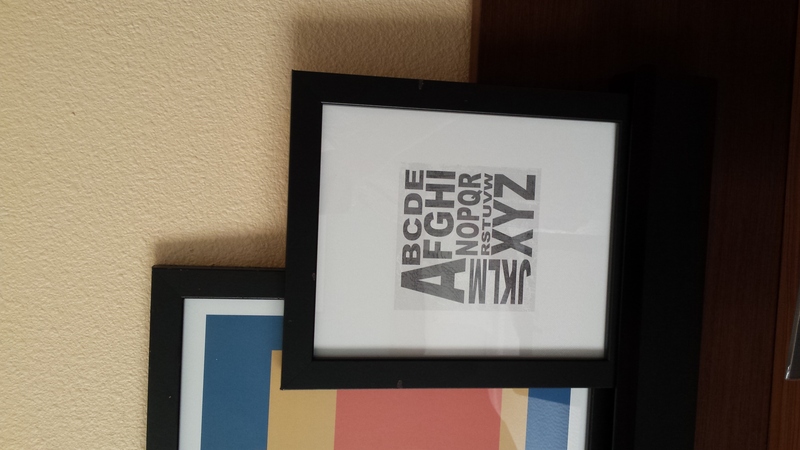 This was artwork that was in the hotel room. 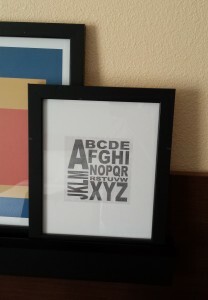 Can you spot the problem? It’s been a long few months since my last post and so much has happened! First of all, Lollypop is here! After a long and hard labor (much, much love to my husband who coached me through it) Lollypop was born on Saturday April 23rd. He (yes, he!) 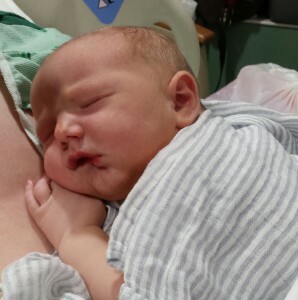 was 9lbs 10oz, 20 1/4 inches long. Jellybean thinks his little brother is nice. He’s so sweet to his little brother – giving him hugs and kisses all the time. Thankfully he pretty much tunes out most of the crying! We’ve found a rhythm to life, and I’m even starting to find time to knit a row or two occasionally. I’ve finished a Citron shawl which was easy, but just lovely. 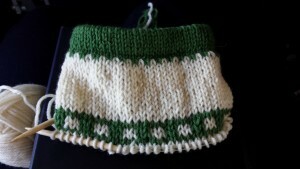 I’m working on winter sweaters for my boys and a new Christmas stocking for Lollypop! I’ve gotten a head start on my Christmas gift knitting, too! 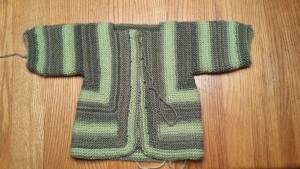 Lollypop’s Winter Sweater in progress. 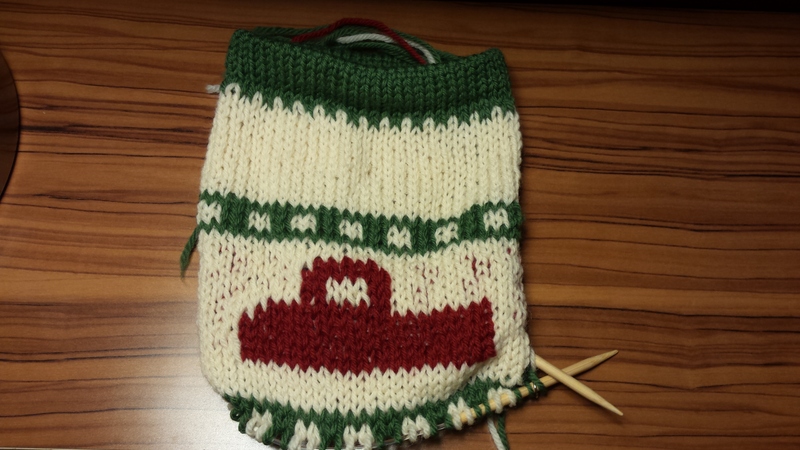 The beginning of Lollypop’s Christmas Stocking. We’ve had lots of big changes these last few months, including me going back to work full time. It’s been exciting and worrysome at the same time. I’m thrilled for the opportunity to get right back into my field of Information Security and I pretty much picked up where I left off after Jellybean was born. I’m doing IT and Information Security audit this time around, rather than being on the implementation side. It means a bit of travel, especially in the fall, but mostly I’ll be working from home. I was really worried about leaving Lollypop, with him being so young and having so many issues, but it turns out that he’s a hardy kiddo and the girls at the preschool just love on him so much. It’s a great feeling to know your kids are in safe, loving hands every day. I’m on my first overnight trip for my job this week. I am excited about it, but I’m nervous and sad, too. I’ve only been away from my husband a handful of nights since we married and I’ve only been away from Jellybean three nights (including when Lollypop was born). I’m glad we moved to be closer to family, so my husband will have some help nearby if he needs it. I know it’ll be OK, but until I’m back home, I’ll be a little worried and nervous. Speaking of my first business trip, I definitely over packed the knitting. I brought Lollypop’s stocking to knit on the plane and I brought two other projects to work on in the evening. Because, you know, I might get bored. I haven’t flown in more than 6 years and the rules have changed a bit since then, so I had to plan what I can knit on the plane and put the rest in my checked bag. 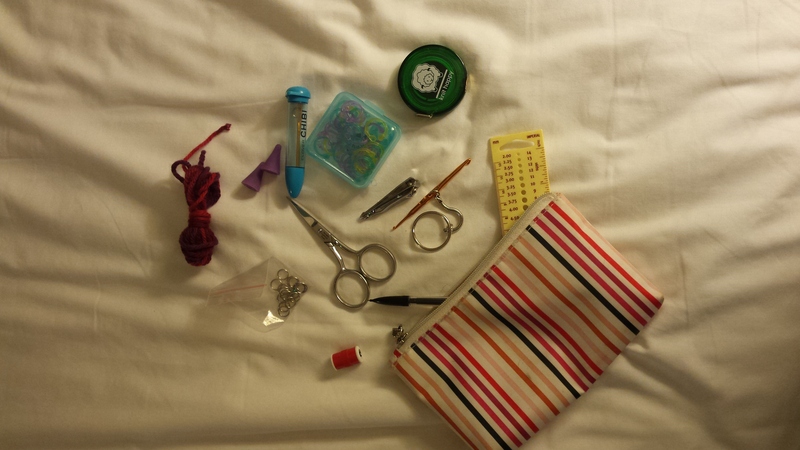 I have a bag of knitting accessories, which holds my scissors, stitch markers, ruler, needle point protectors, etc. I won’t need all of that for this trip, so I pared that down to just the essentials in case it got taken away at security. 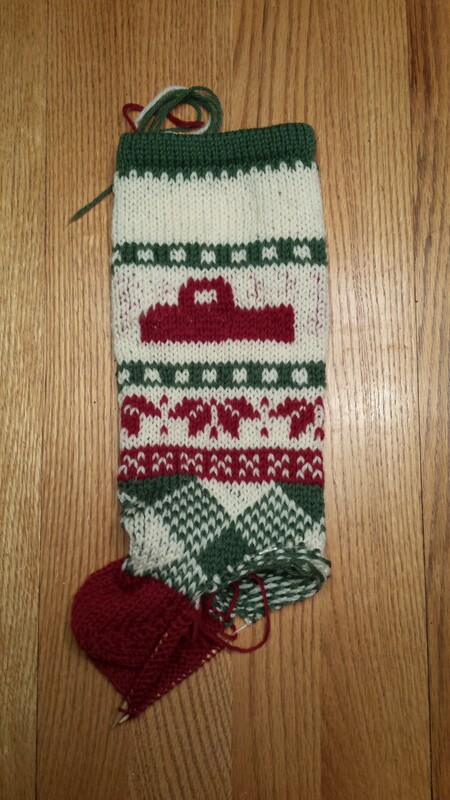 There were no issues, though, and I got to spend the flight knitting away on the stocking. 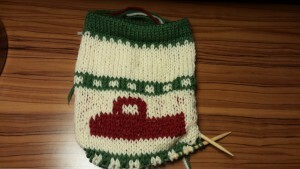 I have managed to get a bit done on the stocking today, with the flying and driving. There will be more driving and flying before the trip is over and I should be able to get a significant chunk finished. And with that, I will finish this rambling post and try to relax before another busy day tomorrow. Have a great week, friends!